It's not just the rest of the competitors in the Olympic Tornado class who find Hans-Peter Steinacher and Roman Hagara's double gold medals a bit strange. Austria does, too. "What is really remarkable is that Austria has got no sea," said Karen Amon, sports assistant with the Austrian Sailing Federation. "But at the moment, sailing is the most successful summer sport here, so we have very good experience. And we are very good." The two-time defending Olympic champions are now either approaching or in their 40s but seem almost scripted to contest - and in all likelihood win - their third straight golds in Beijing next summer. "They're still sailing very competitively. I think a third gold is still quite possible for the Beijing Games," Manuela Kovarik, assistant chef de mission for the Beijing Games, told China Daily last week. "We are quite convinced they will meet our standard." Such confidence in its summer athletes is rare in a country known best for its fearsome alpine skiers. Even its runaway success in Athens, where Austria walked away with seven medals to almost double its previous-best (it got four apiece in 1968 in Mexico City and 1980 at the boycotted Moscow Games) has done little to giddy its senses. As Kovarik concedes, "at the Summer Games, every medal for Austria is a success." Athens was in fact full of surprises. Backstroke specialist Markus Rogan, then 22, captured silver in both the 100m and 200m, while Kate Allen earned Austria its first-ever Olympic triathlon medal in style, grabbing gold at age 34 to help ease it to a 27th-place finish in the overall medal count. But even if they qualify for the Games, should either of them start brushing up on their Mandarin? Not yet. Even though Kovarik praised world No 27 Allen's "very good result" at recent World Cup meets - she came third at Salford in England on Monday - the Olympic official stressed that nothing was guaranteed for any of the athletes. The Austrian Olympic Committee refuses to even think about who will fill its earned Olympic berths until shortly before the registration deadline for the Games on July 23, 2008, but in the case of skipper Hagara, 41, and crewman Steinacher, 38, it is prepared to go out on a limb. And this is despite their wobble at last month's world championships in Cascais, Portugal, where a massive 75 percent of the sailing slots for the Beijing Games were decided. The dynamic duo ranked a passable 20th, but did improve to a best fourth-place finish in the penultimate race. Whether Austria chooses to give them the berth or award it to other sailors is entirely its prerogative. Fortunately for them, they have a nice edge over the competition. Amon said that their age, rather than being a handicap, would stand them in good stead off the Chinese coast. 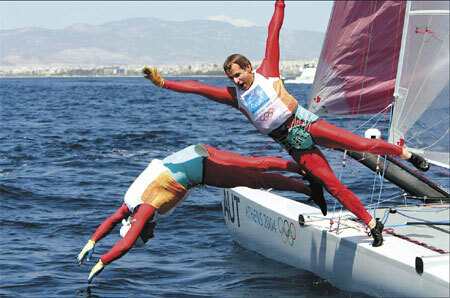 Sailing is considered one of the key sports in which experience can outweigh stamina. "They've been to Qingdao many times. We started them there in September 2005, shortly after the Athens Games, for training. I think the (pre-Olympic test event there this month) will be their fifth time." Even their body types favor the light conditions that threaten to derail many campaigns in Qingdao from August 9-24, and again next year. "Normally such conditions are very good because these two are specialized in light winds," she said. "Neither of them is heavy, both are quite light-weight." And if not, the sailing federation will turn to Athens silver medalist and Laser specialist Andreas Gertizer, although it might want to put his 41st-place finish at the worlds out of mind. "He will be there again. Maybe he can reach a good place," said Amon. Newer hot prospects include Nikolaus Resch and Nico Delle Karth in the men's 49er. A relatively young team, the pair finished 10th in Athens and 2nd in Portugal. Its women's 470 team has also qualified for Beijing. Other medal prospects for the 2008 Games include two table tennis veterans: Liu Jia, one of China's swollen army of expatriate paddlers, was crowned European champion two years ago but failed to defend her title this year, while Werner Schlager was named world champion in 2003. Shooters Thomas Farnik, Mario Knogler and Christian Planer, Athens bronze medalist at the three-position 50m rifle, are also in the running after strong performances at recent major international events.